Baldwin has gone through major changes in the last eight months. While the students seem to have overall positive feelings and are adjusting quickly, Baldwin’s staff are equally critical judges and have been responding well. Mary Johnson, a Baldwin employee for 34 years, is excited about the café’s new look. The dining staff and cooks are happy, and not only for the new amenities. Vanessa Powell, an expo cook in the kitchen, enjoys the student interaction she gains from the renovation. “I like the face-to-face contact I get with the students now that the grill is facing the other direction,” Powell said. Lauffer and the staff believe the more interactive setup will be a positive experience for staff and students. 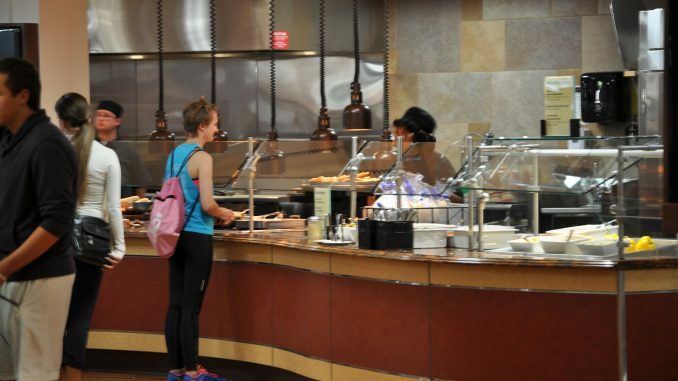 The new equipment helps the cooks and students have healthier lifestyles. The staff is proud of how the renovation went. Everything ran smoothly quite impressively. David Lauffer, Baldwin’s general manager, agrees that while it does look and operate wonderfully, it is still a major transition for everyone. Baldwin has been fine-tuned with smaller changes that have not gone unnoticed by the staff. It seems everyone has embraced a sizable change. Baldwin’s reconstruction has appeared to brighten peoples’ meal experiences, and it may now be a staple of Albion’s campus.